An outside view of CBI headquarters, in New Delhi, Wednesday. 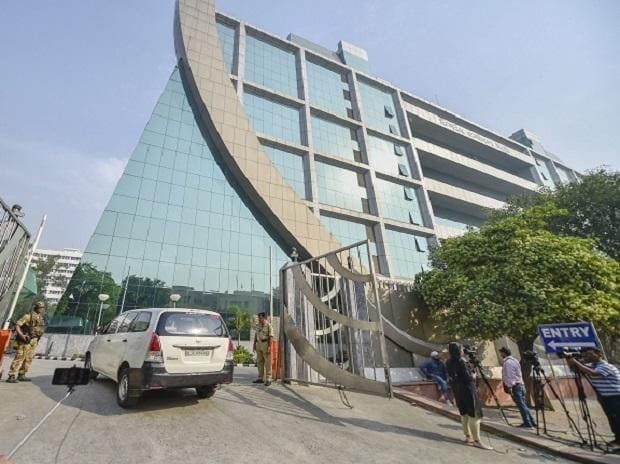 The CBI Friday informed a Delhi court that the Centre has granted sanction to prosecute five people, including serving and former bureaucrats, accused in the Aircel-Maxis case involving Congress leader and ex-Union minister P Chidambaram and his son Karti. Solicitor General Tushar Mehta, appearing for the CBI, Friday told the court that the ongoing probe was about to be completed and sought a brief adjournment in the matter. Senior advocates Kapil Sibal and A M Singhvi appeared for Chidambarams and sought extension of protection granted to them. The court also adjourned the money laundering case, lodged on the basis of CBI case, for the next date after ED's special public prosecutor Nitesh Rana made the request in this regard. The court had earlier questioned the CBI as to why it had filed the charge sheet without getting the appropriate sanction. "What was the hurry," the court had asked. Chidambaram and Karti were named in the charge sheet filed by the Central Bureau of Investigation in the case on July 19. The agency filed a supplementary charge sheet before the special judge, who had fixed it for consideration on July 31. The CBI and ED, in their replies to the anticipatory bail pleas of Chidambarams, had recently told the court that custodial interrogation of both the accused was required since various new materials have surfaced after filing of the charge sheet, alleging that they were not cooperating in the probe. The father-son duo recently denied the allegations of both the agencies that they were evasive and non-cooperative during the probe in the case, and said the allegations against them were "unsubstantiated" and there was no need of their custodial interrogation. The submissions were made in their rejoinder, filed by advocates P K Dubey and Arshdeep Singh, in response to the replies of the probe agencies. P Chidambaram filed his anticipatory bail application in May last year. His protection from arrest has been extended from time to time. The senior Congress leader and his son have come under the scanner of investigating agencies in the Rs 3,500-crore Aircel-Maxis deal and the INX Media case involving Rs 305 crore. In its charge sheet filed earlier in the present case against former telecom minister Dayanidhi Maran, his brother Kalanithi Maran and others, the CBI alleged that P Chidambaram granted FIPB (Foreign Investment Promotion Board) approval in March 2006 to Mauritius-based Global Communication Services Holdings Ltd, a subsidiary of Maxis. The ED is also probing a separate money-laundering case in the Aircel-Maxis matter, in which the Chidambarams have been questioned by the agency and their anticipatory bail is pending.